Which software do you use when you're managing .afdesign, SVG and other vector graphics files? Unfortunately ACDSee doesn't show thumbnails/previews for these file types, so I need to look elsewhere. I'm on Windows 10 pro 64 and all I can find is abeMeda. What works for you guys? If @MEB or any other Affinity mods want to share their tricks of the trade then please jump in. It's vector files I'm wanting to manage. Does XnViewMP actually support .afdesign and SVG files? After an hour and a half's searching on the web yesterday and today it would seem not, but if you can tell me it does (and show me how to achieve it) that'd be great! I simply use Windows Explorer, it displays Designer files without problem. To enable thumbnails/previews in XnViewMP go to XnView ▸ Preferences ▸ General and tick Show all graphic formats. Restart the app. It should now show previews/thumbnails for both Affinity Photo and Designer files. That looks like settings for XnView, not XnViewMP. In XnViewMP it's Tools -> Settings and there are settings in General and in Browser that may be relevant. But with them set, yes, XnViewMP will display the thumbnails for .afphoto and .afdesign files (at least if the user has chosen to save thumbnails with the files in the Affinity Preferences). However, XnViewMP does not seem to show thumbnails for .svg files. They are hidden by default in the XnViewMP Settings, but even if unhidden no meaningful thumbnails are shown. No, those are the settings/configurations for XnViewMP (on Mac). To enable SVG thumbnails remove svg and svgz formats from the exclusion list in Preferences, Browser, File list (on left) then Custom filter tab (on right) again on a Mac. On Windows to display SVG thumbnails go to Tools ▸ Settings... ▸ Browser ▸ Files list ▸ Custom filter and remove svg and svgz from the list. Thanks. Interesting that the settings are so different between Mac and Windows. 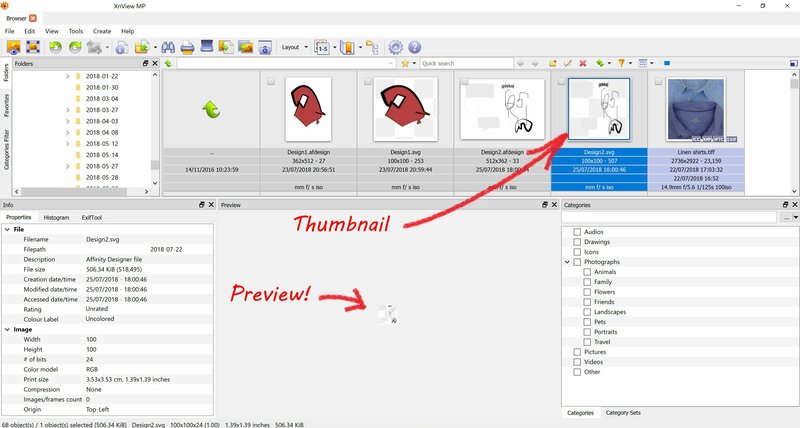 However, while removing svg and svgz from the list causes the files to show up in XnViewMP's display, meaningful thumbnails are not shown, at least on my laptop, which does not have any additional codecs or thumbnail viewers installed. Currently i'm not able to check that on my Windows machine (OS reinstallation) but on Mac it's showing the SVG thumbnails for me. It has a list mode that shows me file names sorted by name, create date, last updated, extension type, etc. It also has what it calls an Icon view which shows me an image view of each (again sorted by many criteria) up to about 3" square. I find it shows 98% of the affinity vector drawings and pixel photos (never figured out why a few it doesn't show). It shows SVG, PDF and pretty much other formats. Right clicking on a drawing will let me choose what application to use to open it up. Of course a double left click opens it in it's native application. It won't do descriptions or notes. But until something better comes along I'm pleased. Really helpful replies. This is where the forum shines: practical, empirical advice. I'll download XnViewMP and try it out with your modifications. Thanks to you guys it's all up and running and looking fine. Now it's time to manage those assets. Walt: Is this what you're seeing? The svg thumbnails are distorted into a square format and blurry but they still give a fair idea of what's inside. Whereas the svg previews really are ridiculous tiny splodges! No. Mine seem to be just a few squares, randomly arranged. Hmm. All I did was follow the instructions from you and MEB. I don't think there are any additional codecs or thumbnail viewers on my machine either. I'll have a go at un-ticking the boxes tomorrow and see if I can replicate those random squares. If so I'll post back. and have a buffering setting applied. But at least one has a preview of the file and open it in a browser will show the real deal. @walt.farrell I've un- and re-ticked everything I did yesterday during set-up, but the thumbnails stay just as shown in the screengrab above. Anything more and I'm out of my depth. Sorry I can't be of help to you, but thanks for helping me. @haakoo That's interesting background info. XnViewMP is working fine for my needs. And it's free! Thanks for suggesting it.